This entry was posted in Healthy Eating, Healthy Living, Recipes, Starting Solids and tagged dairy free, egg free, gluten free. Bookmark the permalink. As a mother of five, three of whom are sensitive to all sorts of foods, I really appreciate simple recipes for foods that are both healthy and enjoyable. Gluten free pancakes are not the same as those made with wheat, but I have come to enjoy these really simple oatmeal pancakes. Maybe some others will, too. Heat a griddle or frying pan to medium or medium-low heat. I have made them on a dry pan and an oiled pan, it doesn’t make much of a difference. Gradually mix the wet ingredients into the dry as you heat the griddle. Stir until well mixed and allow to stand for a couple of minutes. Pour about 1/4-1/3 cup per pancake and allow to cook until edges become dry and top is well bubbled. Flip when they look almost dry, but not burned. Allow second side to cook until steam reduces (a couple of minutes). Enjoy with your favorite topping, plain, or as a slice of “bread” for a gluten free sandwich. I doubled the oats for 3 people but kept the other ingredients the same and added 3 eggs. Delicious!!! We have finally found our pancake alternative! Thank you! Yay! Thanks for sharing the modification. 🙂 It’s so much fun to make a recipe your own! Steel cut oats grind well into oat flour as well. Enjoy. I wonder if you could please specify in your heading that this isn’t a gluten free recipe as some new people recently diagnosed with Coeliac disease could be confused with this being gluten free when it isn’t. Hi Marg! I added a note in the recipe to choose gluten free oats if you are avoiding gluten. Thanks for helping us be clear! Hi :)! I tried out is recipe yesterday and really liked it! I had them with a little bit of powder sugar on top and some fresh fruit and they were great! Perfect healthy alternative to pancakes! And using the oats as the flour is simply genius, I’m wondering if there are more recipe’s taking advantage of that great idea. Help! I’m constantly on a quest for dairy and egg and gluten free oat flour pancakes but they never seem to cook in the middle. These pancakes from this recipe rose more than others I’ve tried but still….ended up raw inside. What am I doing wrong.? Rebecca, if the batter is too thick make it a bit thinner with more liquid (water, juice, oil). Also, I put the griddle/stove at almost medium heat to ensure they cook all the way through. Before you flip them make sure the edges are dry and you can even wait until the tops are almost dry. Depends on how done you like them. Experiment with how hot you have your griddle and how thin you have your batter to find the right mix for you and feel free to post any modifications for others who may benefit. Thanks! Can oatmeal flour be substituted for coconut flour in this recipe? Kim, I haven’t used coconut flour but you could give it a try and share your results. Can coconut flour be substituted for the oatmeal flour in this recipe? Today when I discovered I only have oatmeal left in the kitchen, I panicked. I didn’t want to eat oatmeal since I absolutely hate eating oatmeal. So I search online to see what oatmeal pancake I can make. However to a high school student who is a bad cook, the recipes I looked up was either too hard to make or I did not understand it. When I stumbled over your website, I found it easy and interesting. After I made it and ate it, it was very good. I might introduce this recipes to my friends. Glad to hear it, Owen. Thanks for sharing your experience. This is a versatile recipe that you can modify to suit what’s in your cupboard pretty easily. My granddaughter loves pancakes. Her doctor told her mother she needs to cut down on calorie intake. Do you know if these would be high in calories? Thanks so much. If anyone can comment also please as well. I’m not sure about calories. I think you’d need to evaluate each ingredient to get an idea of the total for your recipe then divide it by the number of servings you make. These are fantastic! We have tried about a dozen gluten free, dairy free, egg free “pancake” recipes, but all of them end up wrong. 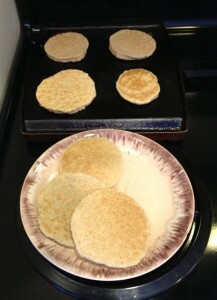 They are not pancakes, they are griddle crispies or scrambled batter or just awful coconut crackers. These pancakes are very similar to the real thing. We had been making these wonderful multi grain pancakes from the Joy of Cooking, but with my son’s allergies to my wife’s beast milk, we had to change our diet. These come the closest to resembling gluten filled pancakes, and are actually a little bit easier to make (but take a little bit longer to cook, so time wise is about the same). These will be or new Sunday morning pancake recipe! Just an update, we have been adding some cinnamon and nutmeg to the batter, adds a lot of flavor! My daughter has gluten and egg allergies. These pancakes were the easiest and delicious with the least no of ingredients. Thanks so much. Thank you for this recipe. My 1yr son has egg, milk allergy but this is a great snack recipe for him. I added pureed apple and mashed banana to two different pancakes and he loves it! Thank you! I just used coconut flour instead of oat since I didn’t have any. They were tasty but didn’t hold together well. would you be able to add nutritional information for this recipe, as i am diabetic and would love to try these. Thank you, with having so many allergies I never thought I would eat anything like pancakes or bread ever again, these were amazing, I added cinnamon and topped with cooked blueberries, simply amazing. I savor end every bite, thank you. Btw I will try pumpkin soon.